The word Orfene is used for “working collectively” in Eastern Aegean, Anatolia, Turkey. 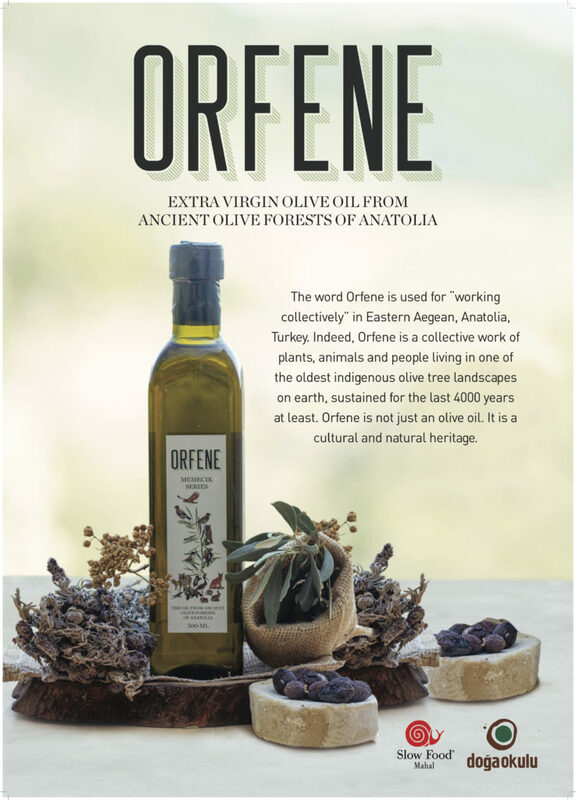 Indeed, Orfene is a collective work of plants, animals and people living in one of the oldest indigenous olive tree landscapes on earth, sustained for the last 4000 years at least. Orfene is not just an olive oil. It is a cultural and natural heritage. 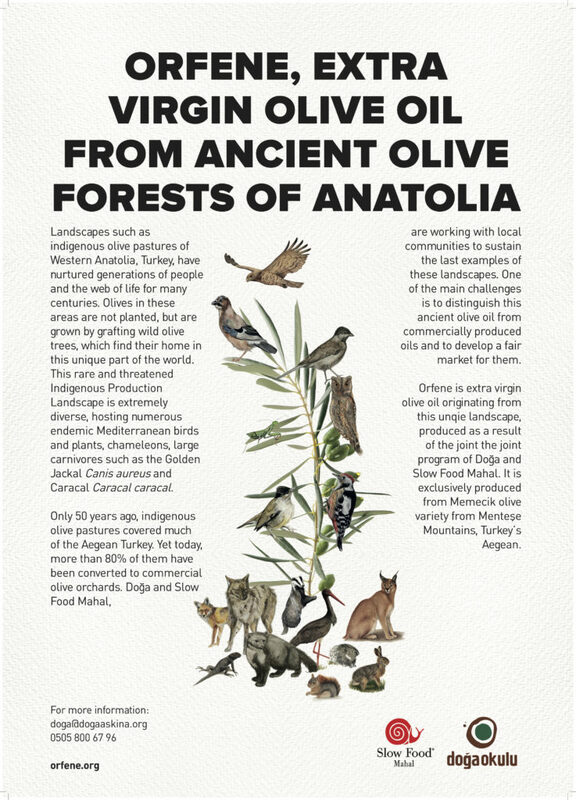 Landscapes such as indigenous olive pastures of Western Anatolia, Turkey, have nurtured generations of people and the web of life for many centuries. Olives in these areas are not planted, but are grown by grafting wild olive trees, which find their home in this unique part of the world. This rare and threatened Indigenous Production Landscape is extremely diverse, hosting numerous endemic Mediterranean birds and plants, chameleons, large carnivores such as the Golden Jackal Canis aureus and Caracal Caracal caracal. Only 50 years ago, indigenous olive pastures covered much of the Aegean Turkey. Yet today, more than 80% of them have been converted to commercial olive orchards. Doğa and Slow Food Mahal, are working with local communities to sustain the last examples of these landscapes. One of the main challenges is to distinguish this ancient olive oil from commercially produced oils and to develop a fair market for them. Orfene is extra virgin olive oil originating from this unqie landscape, produced as a result of the joint the joint program of Doğa and Slow Food Mahal. It is exclusively produced from Memecik olive variety from Menteşe Mountains, Turkey’s Aegean.